6sqft’s series Apartment Living 101 is aimed at helping New Yorkers navigate the challenges of creating a happy home in the big city. This week we’ve found products that can help turn your fire escape into a mini warm weather oasis. If your fire escape is the closest you’ll get to a backyard this summer, fear not–6sqft has dug up some products that will turn this tiny space into much more than a place to set up some potted herbs. From grills to desks, we’ve found six clever items that require nothing more than the railing of your fire escape. Of course, consult your lease and talk to your landlord before installing them (technically putting objects on the fire escape is illegal, however they’re becoming a thing of the past due to safety concerns), but once you get the go-ahead these designs are sure to maximize your outdoor enjoyment. City dwellers who are lucky enough to have a balcony (or maybe just a fire escape) and who also work at home now have the perfect setup for the warmer months. 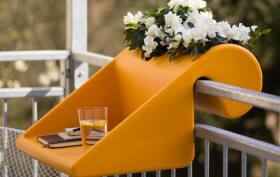 German designer Michael Hilgers created a brilliant balcony desk that hooks onto the railing to hold a laptop or papers. Dubbed BalKonzept, this extremely lightweight design comes complete with an integrated flowerbox, so you can have both a perfect outdoor workstation and a garden. 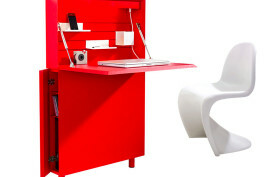 This ultra-thin desk is just like any good roommate: mostly invisible, but around when you need them. Designed by Berlin-based architect and cabinetmaker maker Michael Hilgers, “Flatmate” is a compact workspace that won’t take up much of your valuable floor space, but is just as functional as its full-sized counterpart. Thanks to its skinny profile, it can comfortably live in a narrow hallway or even behind other furniture.